On October 8, 2018, the board of director meeting of the joint research institute of functional materials and electronics established by SIMIT and Juelich Research Center (JRC) has been held in Juelich, Germany. 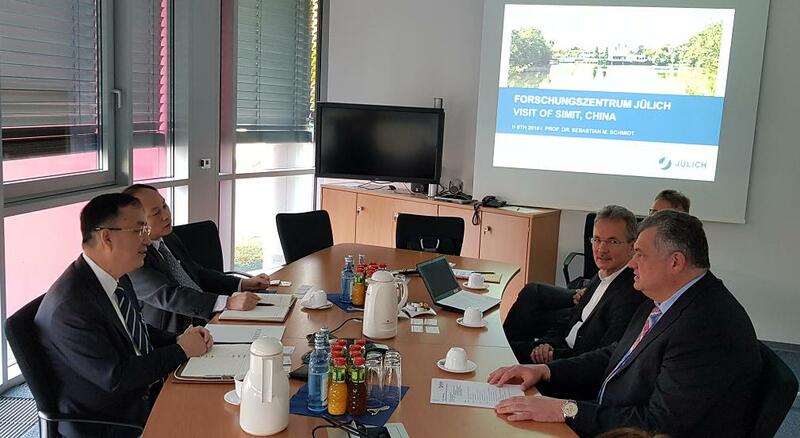 Prof. Xi WANG, director of SIMIT, Prof. Xiaoming XIE, vice director of SIMIT, Prof. Sebastian M. Schmidt, Member of the Board of Directors for Scientific Division of JRC and Prof. Andreas Offenhausser, head of Institute of Complex Systems of JRC, attended the meeting. Prof. XIE and Prof. Offenhausser presented respectively the outcomes from the joint research institute on Superconductivity, Bioelectronics, Quantum Materials and Photovoltaics. The results have been evaluated upon different criteria including overall development, program management, program design, program implementation, and potentiality for future development. The results have been felicitated by the board. It has been concluded that during the cooperation a huge trust has been established. This is the excellent and solid basis for the future cooperation. Both sides confirmed the importance of the cooperation and agree to strength the strategic alignment closer. The board also decided to hold a joint workshop on quantum technology in Shanghai in 2019.